The success of any flower garden depends on the soil more than any other factor. Give a plant loose, airy, well-draining soil of the pH and richness appropriate for that plant and your plants will grow strong and healthy. Moreover, you will rarely have problems with pests and diseases. Though digging can be exhausting, the end results are worth the time and trouble. Soil preparation for flowers serves the function of allowing access to the soil of your garden 6 to 12 inches, perhaps 18 inches in depth. While turning over the soil, you can improve the texture, nutrient content and pH to make it more suitable for the flowers you wish to grow. 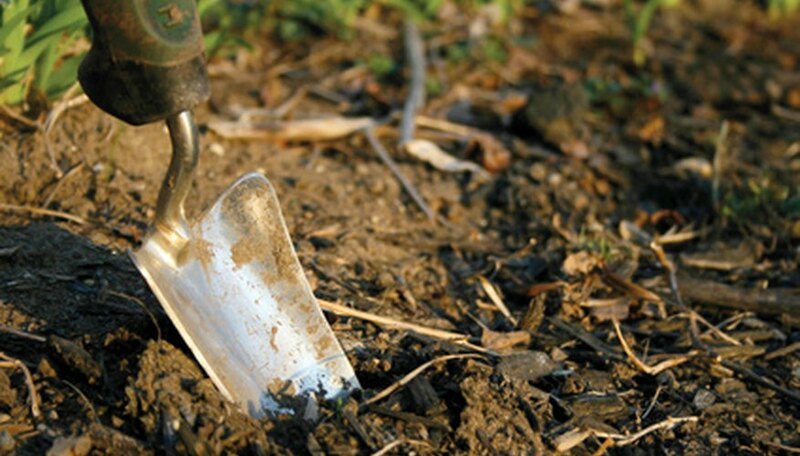 Thoroughly preparing the soil before planting flowers gives you the chance to improve the soil of your garden without working around existing plants. If you will be planting perennials, this will be your only chance to work the soil deeply and thoroughly. You can change the acidity of the soil, work in bone meal to nourish the roots and add organic matter to lighten the soil and hold water and nutrients. Roots need air as well as moisture so the creation of spaces between particles of soil is an important benefit. You can prepare the soil for a flower bed at any time of the year, though a thorough digging in spring will allow you to plant new flowers before summer. Late summer preparation is best for planting spring bulbs, such as daffodils and tulips, because you can work bone meal into the entire area and then plant bulbs in the loose soil. If you are carving a bed out of a lawn, a thick mulch of straw in fall will kill grass and give it time to decay over winter, leaving the surface ready to till. After removing grass and weeds from the surface of the bed, spread a layer of organic matter such as peat, compost, leaves, grass clippings or composted manure across the top of the soil. Mix this layer in with the soil beneath them to the depth of 6 to 8 inches, breaking up clods as you dig. Rake the surface smooth and you're ready to plant. If a home soil test shows that the pH of your ground is acid, less than 6.5, or alkaline, more than 7.0, spread lime to counteract acidity or sulfur to reduce alkalinity across the surface of the bed in the amount specified on the package. Mix into the soil with the organic matter. To nourish roots, add a sprinkling of bone meal, which is high in phosphorous, before you mix. In spring, add some 5-10-10 fertilizer to the organic matter to get your new plants off to a quick start.